IOWA CITY, Iowa (AP) — Republican presidential hopeful Herman Cain has cast himself as the outsider, the pizza magnate with real-world experience who will bring fresh ideas to the nation's capital. 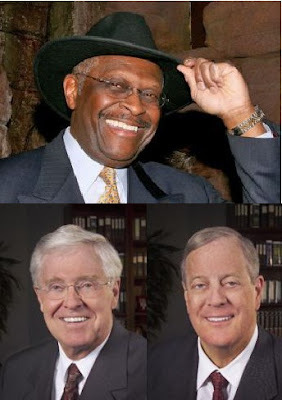 But Cain's economic ideas, support and organization have close ties to two billionaire brothers who bankroll right-leaning causes through their group Americans for Prosperity. AFP tapped Cain as the public face of its "Prosperity Expansion Project," and he traveled the country in 2005 and 2006 speaking to activists who were starting state-based AFP chapters from Wisconsin to Virginia. Through his AFP work he met Mark Block, a longtime Wisconsin Republican operative hired to lead that state's AFP chapter in 2005 as he rebounded from an earlier campaign scandal that derailed his career. When President Barack Obama's election helped spawn the tea party, Cain was positioned to take advantage. He became a draw at growing AFP-backed rallies, impressing activists with a mix of humor and hard-hitting rhetoric against Obama's stimulus, health care and budget policies. Block is now Cain's campaign manager. Other aides who had done AFP work were also brought on board.